I/O Shaken & Stirred was created to celebrate those pushing the boundaries of I/O's contributions to the world and challenge the rest of us to do the same. The mission of the I/O Shaken & Stirred project is to inspire, engage, and challenge the I/O community to broaden the field’s impact and influence through the sharing of diverse ideas and connectivity of members and partners. Designed to be an ongoing project and evolving annual event, I/O Shaken & Stirred aims to create new conference experiences, and supporting online forums, where people across the I/O spectrum and beyond come together in a provocative and entertaining space that inspires and engages us all to push the boundaries of the field and increase our impact and influence. Depending on interest and value with the event over time, we hope to utilize the One Question, Two Minutes format for a few years, and then either change the content dramatically or pass the project on to a new event team to evolve for the benefit of SIOP and the field of I/O. The inspiration for I/O Shaken & Stirred comes from MIT's Building 20 and the remarkable innovations, collaborations, and breakthroughs that came out of an unconventional space. It was built as part of the WWII war effort for research and was meant to be temporary, but it ended up serving as a creative incubator for 55 years. Nine of its inhabitants became Nobel laureates, two became presidential science advisors, the first atomic clock was built there, Noam Chomsky changed the direction of modern linguistics within its walls, and it was where hacking culture (and even the term "hacking") were born. It grew innovative new products and businesses and incubated completely new scientific disciplines. There was a spirit of nonconformity and open exchange within its walls that bubbled up innovation and fast-forwarded progress. As Jonah Lehrer wrote in the 2012 New Yorker article "Groupthink", the space "forced solitary scientists to mix and mingle". No one department owned it, and the tiny offices, long corridors, and mishmash of people and interests led to an exciting stew of creativity. For decades, the building was also famous for great parties, sometimes spontaneous, where people of all backgrounds mixed and ideas flourished. 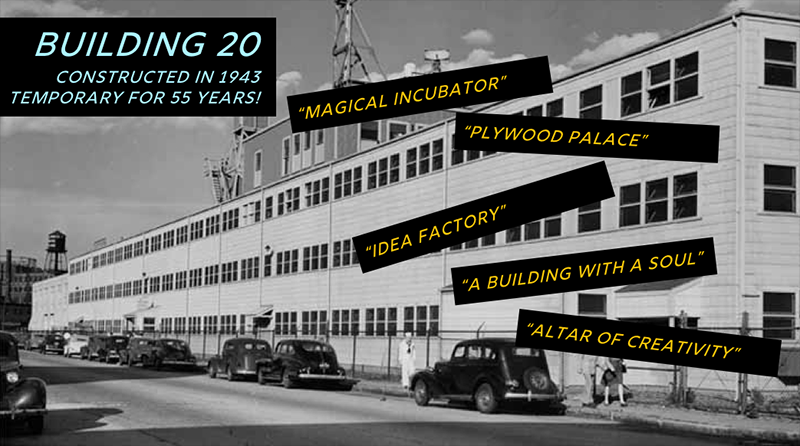 Many have tried to recreate the magic of Building 20, often through creative architecture (e.g., the new Google corporate headquarters complex "Googleplex", and Facebook which actually named a building "Building 20"). Instead of using architecture, our goal was to create an event for SIOP that would bring the best of Building 20 to the I/O community. To create a space that mixes our diverse community, exposes us all to new ideas, challenges us to add more value, and then inspires us to connect and exchange ideas through interaction and dialogue. A 2015 event in Chicago called 20x2 provided the framework needed. 20x2 events have been held annually at the South by Southwest Interactive (SXSWi) conference for 17 years (20x2.org). The format is for 20 people to take the stage for two minutes each to answer one seemingly simple question (the question changes each year). These evening events are held at a local theater space and have an atmosphere of thought-provoking performance pageantry. Alcohol is served, and there is a strong social component: before, during (intermission), and after the event everyone present interacts, reacts to what they have heard, and shares ideas. The mixing and mingling component is organic and relaxed, with no formal structure. The 2017 Orlando I/O Shaken & Stirred event was an exciting, experimental collaboration including SIOP representatives, a diverse range of SIOP member involvement, outside partners, and the I/O Shaken & Stirred project team. The new and innovative format was almost two years in development. The first event was intended to serve as a pilot for a new kind of conference experience, one that would bring the I/O community together in a provocative and entertaining space. Our aim was to create a highly-anticipated annual event that stretches the boundaries of the traditional conference and supports the evolution of I/O science and practice. Thanks to the talents and contributions of so many, our inaugural event was a big hit. In 2018, we're excited to build on that momentum with the sponsorship support of Google to make 2018's event even more meaningful and impactful. I/O Shaken & Stirred 2017 speakers and event team from left to right: Meghan Pickett, Ben Taylor, Mike Morrison, Alexis Fink, Steven Rogelberg, Amy Grubb, John Scott, Megan Nolan, Tom O'Neal, Katina Sawyer, Derek Avery, Jennifer Weiss, Kathryn Dekas, Aarti Shyamsunder, In-Sue Oh, Ben Hawkes, and Cristina Neacsiu. Not pictured: Mikki Hebl and Doug Reynolds. Photo by Barbara Ruland. Yes, it does take a village!